Beginning in the sixteenth century, the Vietnamese people heard the message of the gospel, and many accepted it despite severe persecution by their government. One of these believers was Dung An Trân, born to a poor family in Bac-Ninh in North Vietnam. When he was twelve, his family moved to Hà-Nôi so that his parents could find work. There he met a catechist who gave him food and shelter and introduced him to the Christian faith. He took the name Andrew at his baptism. He became a catechist like his mentor and eventually was chosen to study theology. Andrew was ordained in 1823, and served as a parish priest in Ke-Dâm. He was known for his tireless preaching of the gospel, as well as for his simple and moral life. Moved by his example, many were baptized. Beginning in 1835 he was imprisoned several times. After enduring a dreadful torture he was beheaded in December of 1839. Andrew Dung-Lac wa a priest. He worked in the missions with the priests of the Foreign Mission Society of Paris. Andrew was imprisoned and repeatedly tortured in the persecutions of Minh-Meng. He died with Saint Peter Thi. Andrew was one of the Martyrs of Vietnam. Christian missionaries first brought the Catholic faith to Vietnam during the sixteenth century. During the seventeenth, eighteenth and nineteenth centuries, Christians suffered for their beliefs. Many were martyred, especially during the reign of Emperor Minh-Mang (1820-1840). One hundred seventeen martyrs are in the group. They were proclaimed saints by Pope John Paul II on June 19, 1988. The group was made up of ninety-six Vietnamese, eleven Spaniards, and ten French. Eight of the group were bishops, fifty were priests and fifty-nine were lay Catholics. Some of the priests were Dominicans. Others were diocesan priests who belonged to the Paris Mission Society. One such diocesan priest was St. Theophane Venard. (We honor him also on November 6.) 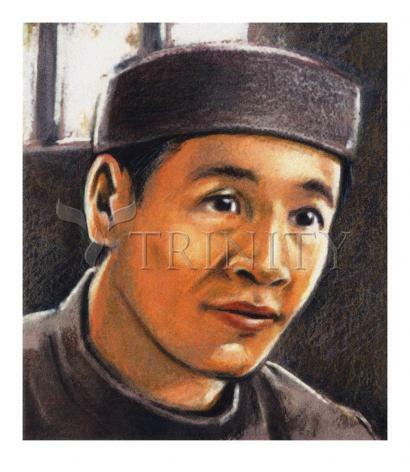 St. Andrew Dung-Lac, who represents this group of heroes, was a Vietnamese diocesan priest. The martyrs of Vietnam suffered to bring the greatest treasure that they possessed: their Catholic faith. These martyrs were able to endure the torture they were put through because of their belief that Christ was with them in everything.